STORServer® Virtual Machine Backup (VMB) lets you back up and archive VMware virtual machines to your IBM Tivoli Storage Manager (TSM) server, on a STORServer Appliance or in an existing TSM environment. STORServer VMB can be installed and configured quickly, takes minutes a day to manage, and is an ideal solution for every mid-market IT manager and administrator who is backing up virtual environments. 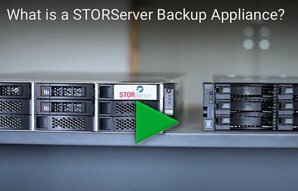 STORServer VMB supports the use of two different backup technologies: one developed by STORServer (this one is used by default) and the other based on TSM for Virtual Environments (VE). You may select the appropriate one based on your backup requirements. For example, if you need to run full machine backups frequently, you may want to use STORServer VMB’s default technology for faster backups that transfer less data. If you prefer an “incremental forever” backup strategy, which eliminates the need for periodic full machine backups in most cases, you could choose the TSM for VE backup technology. Different software and implementation requirements apply. See the product data sheet for more details. Virtual machine (VM) data is moved directly to and from VMs and TSM storage pools without ESX server involvement. VMs continue to operate during backups. The use of scripts is eliminated. Multiple VMs can be backed up concurrently. Changed block tracking (CBT) minimizes the amount of data transferred. VMB backup schedules can be configured to automatically discover and assign VMs that are not already scheduled for either full or incremental backups. Global client options can be used to apply user-specified options to all VMs across multiple TSM servers. E-mail notifications for both schedule and individual VM backup completions keep you apprised of your VM backup status. Relevant error logs are included when appropriate. Restores and retrievals of virtual machines, individual virtual machine files and directories, and virtual disks are all supported. Wizard-like restore dialog boxes walk you through different restore processes.